Kamen Rider Zi-O: Rider Time Part 2- Kamen Rider Ryuki Spinoff Announced! Details for the second previously teased special spinoff film for Kamen Rider Zi-O have been announced at last! This new film will be a revival adventure for 2002’s Kamen Rider Ryuki! After 17 years, a new Battle Royale between Riders has begun! Actor Takamasa Suga will once again reprise his role as Shinji Kido/ Kamen Rider Ryuki for this special. In addition, veteran tokusatsu writer Toshiki Inoue (who wrote several episodes of Ryuki, including the feature film EPISODE FINAL) will be in charge of the script for this project. Rider Time: Ryuki is currently scheduled to be released on the Toei Tokusatsu Fan Club streaming service in March 2019! Stay tuned to TokuNation for further details on this exciting new Rider project! SO-DO Kamen Rider Zi-O Ride4 Revealed: First Look at Kiva and Blade Armor Times! New Sodo figures were unveiled at the Autumn Miyazawa Model Exhibition held recently in Japan. 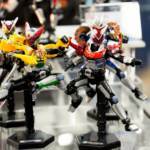 This gives our first look at the upcoming Shodo-X Wave 4 figures which appear to be Kamen Rider Ryuki themed with Ryuki himself, Knight, and Contract Monster Dragreder prominently on display. In addition to those, we have the next wave of SO-DO Kamen Rider Zi-O figures: SO-DO Kamen Rider Zi-O Ride4 on display. 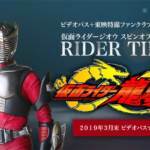 Ride4 will feature the OOO, Kabuto, Blade, and Kiva armor times. This also gives us our first clear look at the full Kiva and Blade Armor Times themselves with more in the wave yet to be revealed. The Shodo-X Ryuki wave won’t be released till April 2019 while you can look forward to SO-DO Zi-O Ride4 in December of this year. 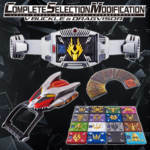 Premium Bandai Complete Selection Modification Kamen Rider Ryuki VBuckle & DragVisor Details Online! After several teasing photos, the next Complete Selection Modification release has been officially revealed! *The CCSM VBuckle contains ALL SEVENTEEN Advent Decks used in the series & supporting media, along with appropriate Contract Monster and Final Vent cards for each Deck. The VBuckle set is priced at 30240 Yen and will be released in December 2018! *The CSM DragVisor comes with all Advent Cards used by the various Ryuki Riders. The DragVisor set is priced at 21600 Yen and will be released in early 2019. *Finally, the CSM VBuckle & DragVisor Set contains all decks, cards and necessary equipment. This full set is priced at 51840 Yen and will be released in December 2018! UPDATE! A special video preview of the VBuckle & DragVistor set has been uploaded to Bandai’s official YouTube channel! 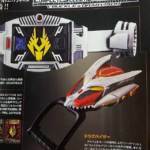 First Images Of Complete Selection Modification Kamen Rider Ryuki V-Buckle & DragVisor Posted Online! A few early magazine scans have given us a quick look at the next entry (or ENTRIES in this case) in the Complete Selection Modification collection series! The CSM V-Buckle & DragVisor from Kamen Rider Ryuki are on full display, perfectly recreating the Dragon Knight Rider’s henshin device and main accessory gimmicks. 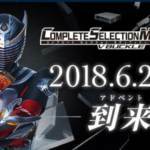 This new V-Buckle is said to have new sound effects, while the DragVisor will apparently include ALL THIRTEEN of Kamen Rider Ryuki’s Advent Decks! *A stand-alone release of the V-Buckle will come later in December, while the DragVisor’s individual release is scheduled for January 2019. 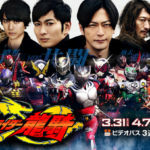 Definitely some exciting news for Kamen Rider Ryuki fans! Stay tuned to TokuNation as we keep you up to date on all Complete Selection releases! The next big release for the Complete Selection Modification collector series has apparently been revealed! A teaser image has been posted for a CSM V-Buckle, the henshin belt used by Kamen Rider Ryuki! The V-Buckle requires an Advent Deck to work properly, and it remains to be seen if this Complete Selection release will include all (or ANY) of Ryuki’s Decks. A full reveal date of June 25 2018 is listed with the teaser. So stay tuned to TokuNation between now & then as we keep you up to date on this exciting new release! Bandai’s Kamen Rider Converge line has just announced a massive set themed after characters from Kamen Rider Ryuki. 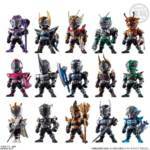 While shown, the Alternatives, default Ryuki, and default Knight do not appear to be included with the set. None the less, the Kamen Rider Converge Ryuki Complete Edition will run you 12,000 yen and will see release in July, pre orders are set to begin March 3rd.